Are you living with a Minecraft fanatic? Looking for a few fun and unique gifts? 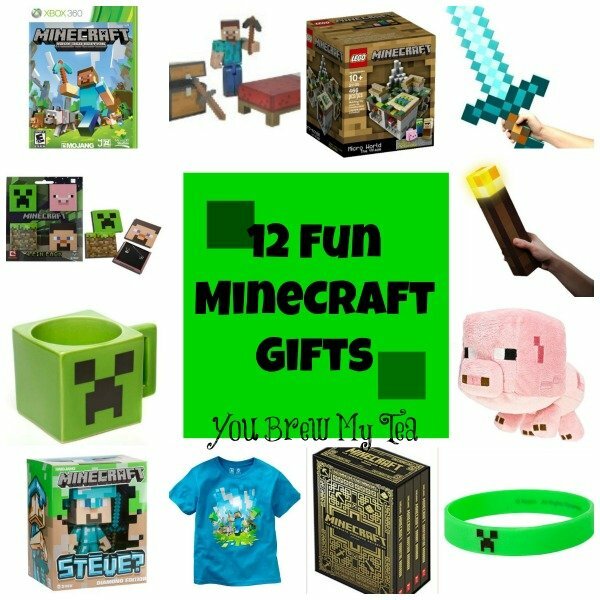 We have you covered with this selection of Minecraft gift ideas to bring smiles to their faces (provided they look up from their game to grin). From stocking stuffers to clothing and toys you can find the perfect item here. These 12 Great Minecraft Gifts are sure to please all of the Minecraft players on your holiday gift list! This post contains affiliate links. I earn a small commission through purchases made through these links. 1.Minecraft Xbox 360– Take Minecraft play to a new forum from the pc to game system. 2.Minecraft Core Player Survival Pack– The new action figures of today this survival pack is a great starter. 3.Lego Minecraft Village– LEGOs and Minecraft? That is enough to make any fans head spin. 4.Minecraft Sword– Get them outside and moving with this replica from the game. 5.Minecraft Wall Torch– How cool would this be to add to a Minecraft themed bedroom? 6.Minecraft Baby Pig– Soft and cuddly, a perfect friend for bedtime dreams of Minecraft. 9.Minecraft Adventure Shirt– Let them sport their favorite character loud and proud on this fun t shirt. 10. Minecraft Steve Figure Vinyl figures are just plain fun to collect. 11.Minecraft Creeper Mug– Hey if you are the Minecraft fan, I am not judging-get your morning cup of joe inside this creeper mug! 12. Minecraft Pin Pack– An ideal stocking stuffer that can be kept, or traded. Pinned to shirts, backpacks, or anywhere else. Don’t stress over finding the perfect gift when you have this great list! These great Minecraft gifts are sure to be a hit. Make sure to grab the handbook, a few of the cool accessories and of course q Minecraft Sword for everyone on your list!